One day, as she’s still adjusting to her new high school, Kasumi Toyama discovers a trail of stars that leads her to an old thrift store. Inside, she makes a discovery. Episode 2: We Did It! Kasumi's heart is set on forming a band, but Arisa wants nothing do with it. In fact, Arisa is so determined to avoid her that she puts the star-shaped guitar up for auction. Episode 3: I Ran Away! Kasumi asks Rimi to join her band, but Rimi is reluctant. Meanwhile, Glitter*Green runs into an issue on the way to their show. Episode 4: I Got Angry! Kasumi starts staying after school to take guitar lessons from Tae. Meanwhile, Arisa seems to have a problem with all the time they are spending together. Episode 5: My Heart Was Racing! Kasumi, Tae, and friends are preparing for their first performance. Are they going to be ready in time? Episode 6: I Made It! 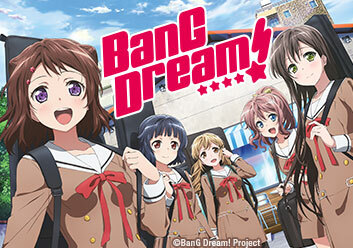 Kasumi begins to struggle in school and enlists Saya's help. Meanwhile, Arisa has been searching for the perfect band name. Kasumi has a tall order in convincing Saya to join Poppin Party, is she able to do it? Meanwhile, they continue to get ready for the Culture Festival! The Cultural Festival preparations are done, and it is time for it to begin. Meanwhile, Poppin' Party play their first show! How does it go? Episode 9: I Got a Job! Saya gets a new drum set and the girls all get jobs at Space! They learn what goes into putting on a live show. Episode 10: I Was Surprised! Poppin' Party auditions at Space but to play there you must impress the owner. Do they achieve their dream? Kasumi is still struggling to find her voice but the rest of Poppin' Party is there to help pick her up. Poppin' Party gets another chance to play at Space. Will they finally impress the owner? Kasumi finally achieves her dream as Poppin' Party plays at Space's last show. How will they perform?